Well, it has been quite a wet summer since our dry spell at the very beginning of the summer. I am looking forward to next year's blooms already. With all of this rain, I'm thinking the peonies should have plenty of fuel to create next year's buds and store lots of energy in their roots for next year's blooms. With the rain come lots of competition, weeds! I use hardwood mulch as a weed deterrent on most of my peonies. I have a couple of beds that are just dirt which I have to hoe to keep the weeds out. 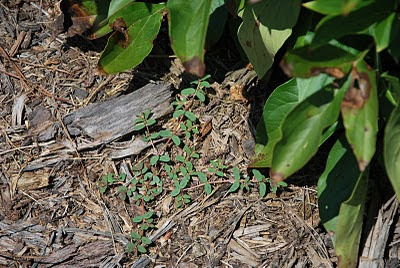 I also use weed spray around the edges of the mulched beds. Without this I don't think there would be any way I could keep up! Even in the mulched beds some weeds still sprout. So I end up pulling these by hand. I got up a lot of these weeds yesterday, but they're still out there.